At one time or another, every writer has experienced the dreaded, “now what do I write?” rut that brings even seasoned writers to their knees. Follow the Contour system and answer just these 4 questions and you’re well on your way to creating a masterpiece: Who is the main character? What is the main character trying to accomplish? Who is trying to stop the main character? What happens if the main character fails? Contour, the dual-platform, award-winning story development system developed by Emmy Award-nominated Jeffrey Alan Schechter, is designed to take your idea and turn it into a bulletproof outline. Contour teaches you the perfect blend of plot-driven versus character-driven storytelling that blockbuster movies use to create solid stories that hold together from Fade In to Fade Out. Do your stories lack cohesiveness from start to finish? Contour explains the major storytelling secrets needed to craft a highly marketable movie. Your main character’s journey is explained through archetypal themes – the same kind of themes used by most of the top 50 movies that have affected millions of viewers – maybe even you! Worried about how to start? Don’t be. For many, it’s much easier to understand the Contour system by following the breakdown of a successful movie. 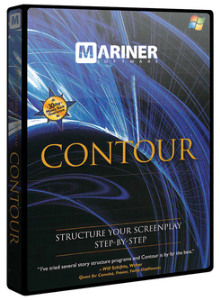 Contour includes several entire scripts of blockbuster movies dissected through the Contour system. And if you need even more samples of how Contour works, follow Jeffrey Alan Schechter’s personal blog as he breaks down current screenplays in Contour.